The present study explored a workshop method including questionnaires but also creative, implicit methods as a new way of uncovering users’ implicit concepts of a helper and supporting creative answers by users. Eight older (70+) and ten younger (<70) participants collaborated in the workshops. They filled in a questionnaire and completed a picture association activity as well as a creative modelling unit. The word ‘robot’ was not used in the entire workshops to prevent users from directly thinking of robot stereotypes. Results demonstrated that picture associations cause a higher amount of answers regarding features of a ‘helper’ than direct questionnaire items. 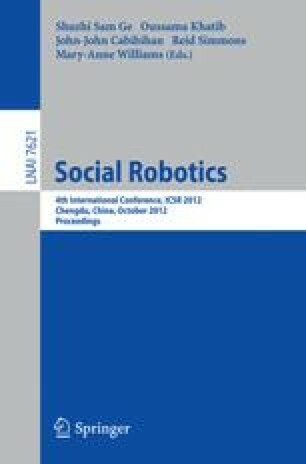 These results can be translated to the field of social robotics. According to the findings, users preferred a structure of the helper that featured arms, some kind of body and a head they could talk to. Most of all, picture associations played an important role in revealing the individual concepts of users. These results suggest that the method of implicit questioning is a useful additional approach in the assessment of user requirements and human-robot-interaction research.